This luxurious 5 bedroom villa sleeps up to 10 people. It is split over 3 levels and modernly furnished throughout, with 2 living areas and en-suites off all the bedrooms. Each room is bright and spacious, with plenty of natural light coming into the villa. There is free unlimited wifi included. 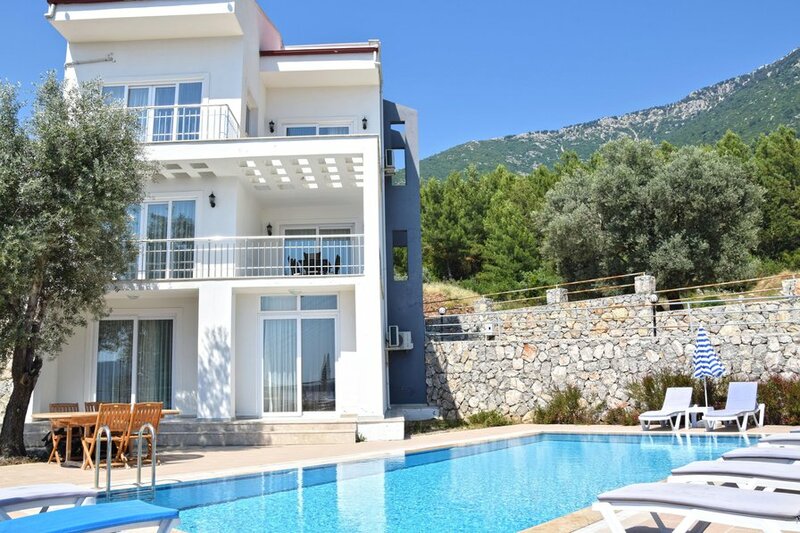 Set up on a hill with breathtaking views of Hisarönü, Babadağ mountain and the sea, this large villa allows you to be away from all the hustle and bustle, so that you can have a completely relaxing holiday. Its' private pool and garden are peaceful areas for you and your family to enjoy the summer weather. There is also a sizeable shaded terrace complete with a BBQ area, perfect for dining alfresco and escaping the Turkish heat. Situated just off the second road through Ovacik, in an area of outstanding beauty overlooking the nearby Taurus mountain range, the position offers easy access to local amenities, as well as being superbly located for ease of travel to the nearby party town of Hisarönü (5 minutes' drive); cosmopolitan city of Fethiye (10 minutes' drive) or Ölüdeniz Blue Lagoon (10 minutes' drive) beach resort on the Turkish Riviera.